+379 – ویٹیکن سٹی تفویض لیکن استعمال کیا جاتا ہے +39 اطالیہ. +7 – روس (کی طرف سے منظم - روس; کچھ باہر کے علاقوں کو بھی تفویض منجانب روس). ^ ا ب پ روس، Kazakhstan, and Abkhazia make up the Seventh World Numbering Zone. From August 2007, Kazakhstan changed all area codes to start with 7; however, 6 is also reserved for Kazakhstan. Digits 3, 4, and 5 are reserved for روس۔ Abkhazia was تفویض +7 840 for landline and +7 940 for mobile operators on 28 September 2009. Abkhazia will also continue using +995 44. 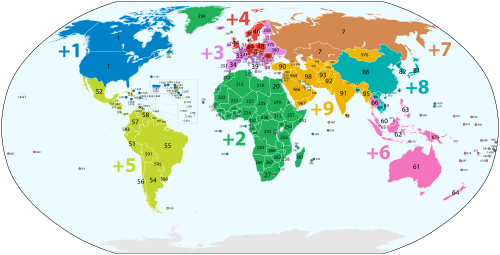 Other digits are reserved for Russia. Currently, there are no internationally accessible numbers starting with 0, 1, 2 or 5 – these are access codes and similar arrangements.